I thought it was about time that I introduce myself. My name is Rachel, I’m 34 and this is my third blog. I have a job as a Youth Services Library Assistant at my local public library, so I get to work with children, teens and their parents all day (which is exactly the subject I got my Masters in) . I was born in Germany, but grew up in the US, predominantly the Southeast, though I don’t really have an accent unless I’m tired or visiting the South. I currently live in Phoenix, Arizona and have lived in the state for 3 1/2 years. This is an entirely different climate from what I grew up with, but I enjoy living here. Arizona has gorgeous sunsets, and I like all the different environments (i.e. deserts with cacti, mountains, grassy tree-filled areas, and flat windy plains). 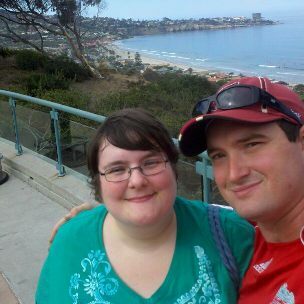 I have been married for 9 years to my husband John. 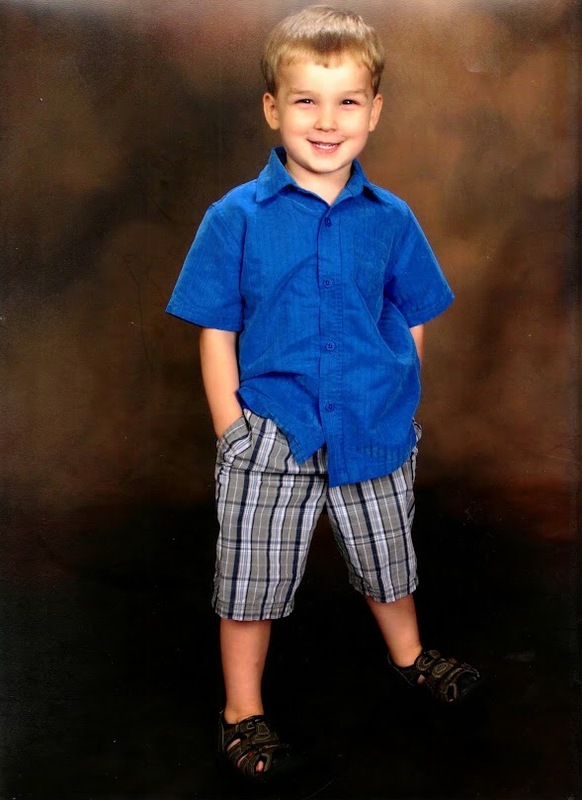 I am mom to my adorable and crazy 3 1/2 year old son, Liam. See pic below. The real Patch Adams (not the one played by Robin Williams in the film of the same name) visited my undergraduate school, Virginia Commonwealth University (VCU) when I was a freshman as well as my church. He was hilarious and I watched him actually get all the way inside a pair of clown pants on a stool in the pulpit, and some people were so offended, they walked out. After watching him do a lecture at my school, I waited in line for awhile to get his autograph and seeing that I didn’t have one of his books, he told me to go get a free one. I went to the back of the line to wait my turn, not wanting to cut in front of all the other people that had waited. After about 10 minutes, the guy originally standing behind me in line came back to get me and told me to come to the front. Patch was amazed that I was willing to wait in the back of the line and told me “If there were more people like you, there wouldn’t be any wars,” which is still one of the best compliments anyone has given me. I went to University of St. Andrews in Scotland at the same time that Prince William was studying there. Unfortunately I never saw him as he switched from Art History (the department I was in) to Geography the year I was there. St Andrews is a small town, but I never saw him out and about either, which is odd as most of my friends did. 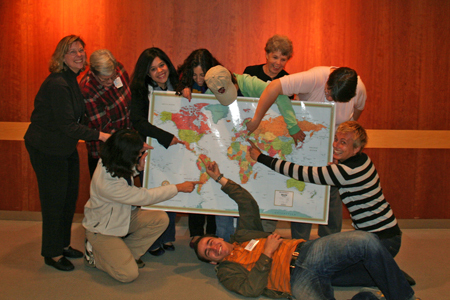 I volunteered for two years with this awesome program at my local public library in Columbia, South Carolina called Let’s Speak English, which matched up English speaking volunteers with internationals to help with their conversation skills. It is a nice informal place where internationals of all levels can practice their English. Picture below has me in the far top right in white with my head down. The map is showing where everyone was born. I also worked with a similar program called Talk Time in Phoenix for a year, which was also a lot of fun. I’m hoping to get to volunteer with internationals again soon. My family has a Bassadore (yes this is a real breed, done on purpose), which is a Golden Lab/Basset Hound mix dog. She looks like a Golden Lab but she has the sunken eyes, extra floppy ears, and short stature of a Basset. 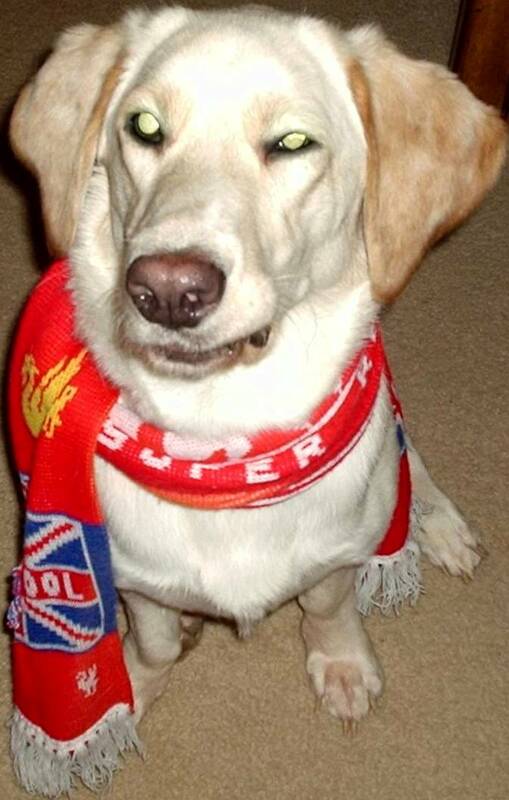 See pic below (I swear she’s not a zombie pooch, but she does support Liverpool FC along with the rest of the family; Go Reds!). My husband is British and is from Lincolnshire (on the central west coast of England). I was once stuck in the Belgian town of Duffel at night after failing to get off the train at the right stop. I don’t speak Dutch, as they do in the northern parts of Belgium, but luckily the people I was staying with came and rescued me. I later did a hand-built clay duffel bag commemorating this event in university. I helped create/edit this calendar while doing an Independent Study with the South Carolina State Library. I collect quotes, children and YA books and cookbooks. I am a huge L.Frank Baum fan. One of the prizes of my book collection is a first edition of Dorothy and the Wizard of Oz, which has color plates inside. Because of graduate school in St. Andrews and Let’s Speak English, I have friends that live or are from Greece, Portugal, Brazil, Hong Kong, Canada, Iran, South Korea, England, and Columbia. I studied Art History for my undergraduate degree and one of the coolest things I got to do while in school was do a Study-Abroad program in Italy, specifically Florence (Firenze) and Rome. The food was amazing and it was so incredible to talk about a piece of art in class and then go see it in-person. Some of my favorites included Michelangelo’s work at the Sistine Chapel and a number of beautiful sculptures by Bernini. Goodreads : I also post my reviews on this site, but it includes my to-read list, as well as the complete list of book I have read. *Note: My blog is best viewed on Google Chrome or Internet Explorer 9. For some reason it likes to glitch out and merge columns in Internet Explorer 8. It does not do this if you look at individual posts, just from the first page. Library Mom by Rachel Huddlestone is licensed under a Creative Commons Attribution-NonCommercial-NoDerivs 3.0 Unported License. I am glad for writing to make you be aware of of the extraordinary experience my wife’s daughter had reading your site. She figured out several pieces, with the inclusion of what it is like to have an excellent teaching spirit to get many others effortlessly comprehend several tortuous subject areas. You really did more than our own expectations. Thanks for providing these insightful, healthy, edifying not to mention fun tips about this topic to Jane. I nominated you for another Liebster because you continue to be awesome.